The purchase price of a single raffle ticket is $25 (OR five tickets for $100). A maximum of 1,000 tickets will be sold for the 2018 Model A Car/Cash Raffle. The proceeds from this raffle will benefit TAC Industries, Inc. (“TAC”), and will be used to purchase a community inclusion vehicle to transport developmentally disabled people to live, work and play in the communities of their choice. Tickets may be sold through a cash, check, or credit card transaction; by delegated TAC representatives through a cash or check transaction; or through the TAC website (http://bit.ly/CarORcash) by credit/debit card purchase. Tickets purchased online will be available at TAC for pick-up, or delivered through the United States Postal Service, whichever is designated by the purchaser. Contact information of the purchaser, to include legal name, address, telephone number, and e-mail address if available, must be supplied at the time of purchase. 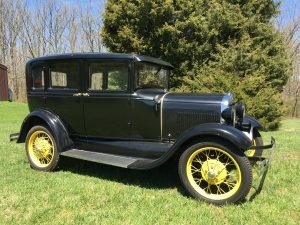 All entrants understand and agree that they are entering to win one of twelve awards: the first prize winner may choose either $5,000 cash or a 1929 Model A car valued at $12,000. 2nd prize– $1,000 cash or ten third prizes ($100 each). Total prize money to be awarded: $7,000 cash or Car + $2,000 cash. The winners are responsible for (and must supply his/her social security number), and is pay any sales and/or excise taxes, fees, assessments and the like charges associated with the prize, including license, title and registration fees. 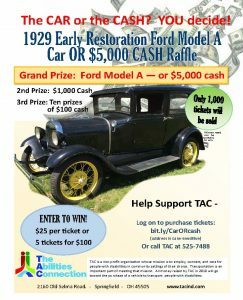 Winner of the Model A car must make arrangements with TAC to take delivery of the car prior to November 16, 2018. All winners are responsible for any taxes and fees. The Model A car winner accepts the condition of the vehicle in its “as is” condition. The raffle is open to legal residents of the United States who are age 18 and over. Only 1000 tickets will be sold at $25 each or five (5) tickets for $100. Purchaser must purchase tickets in lots of five (5) to receive the discounted ($100) ticket price. There is no limit to the number of tickets an individual may purchase. The odds of winning are 1/ 1000 (or based on the total number of tickets sold). Tickets must be filled out in the name of a single individual. Ticket sales are final and are non-refundable. Prizes will not be awarded and shall be forfeited if winner’s ticket was issued in exchange for a check returned for “insufficient funds” or for a credit card declined, invalid or otherwise rejected. Checks/money orders should be made payable to: TAC Industries, Inc. Ticket sales will cease on October 7, 2018 at 5:00 p.m., or when 1,000 tickets are sold, whichever comes first. Requests for tickets after 1,000 tickets have been sold will be returned to the requester. Online ticket sales will cease Friday, Oct. 5, 2018 at 12 noon. The winners will be selected at a random drawing on October 7, 2018 at 6:45p.m. at TAC The Auction Event. Entrants do not need to be present to win. The winners will be notified by phone according to the contact information provided to TAC at the time of entry. In the event a winner cannot be contacted, fails to respond within seven (7) calendar days, fails to otherwise qualify for the prize and/or declines the prize, an alternate winner will be selected. If not claimed within seven (7) calendar days of notification, the winner designee will forfeit any rights to the prize and the same will be awarded to an alternate winner. Prizes are neither assignable nor transferable. The winner assumes and must pay all local, state and federal taxes on their 2018 taxes. Winnings are subject to all tax provisions as stipulated by the IRS and must be paid by the winner. The winner must submit an IRS Form 5754, Statement by Person(s) Receiving Gambling Winnings, to TAC prior to delivery of the prize. Form 5754 identifies the name, address, and social security number of the winner. TAC Industries will file IRS Form W-2G, Certain Gambling Winnings, as required and/or appropriate to report the value of the prize won. TAC assumes no responsibility for the winner’s tax obligations and suggests consulting a tax advisor with any questions. This offer is void where prohibited by law and all federal, state and local laws and regulations apply. Once awarded, prizes cannot be exchanged. The winner must have proper identification when claiming the prize. No portion of the ticket price is considered a charitable contribution for purposes of deductibility. Net proceeds benefit TAC. By receiving a prize, winners agree to release and hold harmless TAC, its respective subsidiaries, advertising/promotion agencies, and prize suppliers, and each such company’s officers, directors, employees and agents (collectively, the “Released Parties”) from and against any claim or cause of action, including, but not limited to, personal injury, death, or damage to or loss of property, arising out of participation in the raffle or receipt or use of misuse of any prize. Except where prohibited, in order to provide legitimate validation of a winner having been drawn at the conclusion of the raffle, participation in the raffle constitutes winner’s consent to TAC of use of winner’s name, likeness, photograph, voice, opinions and/or hometown and state for publication purposes in any media without further payment or consideration. Any contact information of ticket purchasers and winners will not be released to the public. .TAC reserves the right to cancel, suspend and/or modify the raffle, or any part of it, if any fraud, technical failures or any other factor beyond TAC’s reasonable control impairs the integrity or proper functioning of the raffle, as determined by TAC in its sole discretion. TAC reserves the right in its sole discretion to disqualify any individual it finds to be tampering with the raffle process or to be acting in violation of these Official Rules or any other promotion or in an unsportsmanlike or disruptive manner. Any attempt by any person to deliberately undermine the legitimate operation of the raffle may be in violation of criminal and civil law, and, should such an attempt be made, TAC reserves the right to seek damages from any such person to the fullest extent permitted by law. TAC’s failure to enforce any term of these Official Rules shall not constitute a waiver of that provision. By entering the raffle, each entrant unreservedly agrees to these terms and conditions that govern the raffle and the awarding of the prizes. The Official Cash Raffle Terms and Conditions are posted on the TAC website (http://bit.ly/CarORcash) from the start of the raffle until October 30, 2018. To obtain a copy of the Terms and Conditions or a list of winner(s) following completion of the raffle (please specify which), send a self-addressed, stamped envelope specifying “Terms and Conditions” or “Winner List” to TAC Industries, Inc. 2160 Old Selma Rd., Springfield, Ohio 45505-4600, ATTN: Mike Ahern. A copy of the Terms and Conditions and a list of winner(s) (when complete) are also available during regular business hours at the main offices. All such requests must be received within thirty (30) days following completion of the raffle.